Moon will cross the border into the North for his third meeting with Kim Jong Un on Tuesday, amid scepticism over whether the North Korean leader was serious about denuclearisation, a goal vowed at his summit with U.S. President Donald Trump in June. Trump last week asked Moon to act as "chief negotiator" between Washington and Pyongyang, according to Moon's spokesman, after Trump cancelled a visit to Pyongyang by Secretary of State Mike Pompeo last month. Moon will discuss ways to achieve that goal with Kim, seeking to engineer a proposal that combines a concrete framework for North Korea's denuclearisation and a joint declaration ending the 1950-53 Korean War, Seoul officials said. The South Korean scheme would call for Pyongyang to promise to reveal or declare its nuclear and missile facilities, followed by a joint end-of-war declaration, two sources familiar with the issue said. North Korea would then provide an actual list of the sites for verification and eventual decommissioning by international inspectors, said the sources who were not authorised to speak publicly. Pyongyang and Washington have been at odds over whether the North's denuclearisation or declaring a formal end to the war should come first. The Korean War ended with an armistice, not a peace treaty, leaving U.S.-led U.N. forces including South Korea technically still at war with the North. "The deadlock resulted from mutual demands that the other side take action first, and I think we can surely find a point of contact," Moon Jae-in told a meeting on Thursday with advisers on the summit. "One of the roles we should play in the middle is to find the point of contact and present it, and expedite dialogue again to accelerate the denuclearisation process." South Korea is pinning high hopes on Kim's remarks to Moon's special envoys last week that he wants to realise denuclearisation within Trump's first term in office ending in early 2021, the first time line he has ever given. In another upbeat sign, Kim has offered a second summit in a "very warm, very positive" letter to Trump, and the White House said it is looking at scheduling one. "The United States would want to have a solid roadmap, but the North has been avoiding it and instead unilaterally taking what it calls denuclearisation measures that fall far short of U.S. expectations," said Cho Tae-yong, a former South Korean deputy presidential national security advisor and nuclear negotiator. "If President Moon manages to help both sides move toward some kind of framework agreement, he could indeed wind up being a catalyst for negotiations, but that's a very tough task." Compared to the first summits in April and May, where the mere fact of Kim and Moon's meeting mattered, the two are now under pressure to deliver substantive progress. North Korea has demanded U.S. security guarantees as key conditions for its disarmament, and ending the war is an integral element of that. U.S. officials say they have already made their own conciliatory gestures, including halting joint military exercises with South Korea. "For the United States, there's too little trust in North Korea to make an end of war announcement just with their promise to declare the facilities," a diplomatic source in Seoul told Reuters on condition of anonymity due to the sensitivity of the matter. "As for the North, such declarations are too much to give for ending the war, which could be done only with a piece of paper." 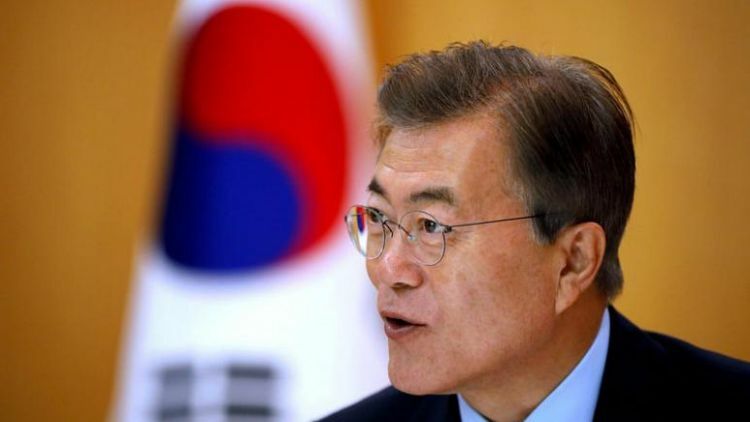 Frank Aum, a senior expert at the United States Institute of Peace in Washington, said Moon may need to press North Korea for more definitive steps, such as freezing nuclear and missile production, amid signs that the North is continuing to produce nuclear weapons. Setting specific target dates for each action would also be key, suggested Shin Beom-chul, a senior fellow at the Asan Institute for Policy Studies in Seoul. For example, the North could promise to submit a list of facilities by November in return for an end of war declaration in December, and arrange a first round of inspection in early next year, he said. "It's not a losing game for Trump - inducing North Korea's commitment to facility declarations and inspections would itself be a diplomatic coup for him," Shin said. Leaders of the two Koreas will also examine progress on their April summit agreement to improve inter-Korean relations and reduce military tensions. As first steps, North and South Korea will open a joint liaison office on the North's side of the militarised border on Friday to serve as a de facto embassy. The neighbours are also discussing reconnecting railways and roads, and lessening guard posts along the heavily militarised border. But Moon's desire to advance ties with the North despite little progress on denuclearisation has raised alarm bells in Washington, with U.S. officials worrying it could weaken Pyongyang's resolve to disarm. Moon's officials also asked top South Korean business leaders to join his Pyongyang trip. But company executives say tough economic sanctions, effectively banning any business with the North, could make it tricky to go this time around. Officials at Samsung Electronics, Hyundai Motor, LG - which were part of delegations for 2000 and 2007 summits in Pyongyang - said no decision has been made yet on participating. In July, three South Korean firms imported coal from North Korea disguised as Russian products in violation of U.N. sanctions, South Korea's customs agency said. "The import of North Korean coal already demonstrates that South Korea has not vigorously imposed U.N/U.S. sanctions," said Bruce Bennett, a senior researcher at the RAND Corporation in Santa Monica, California. "How will President Trump feel if South Korea is responsible for undermining his campaign?"